DCC accessory decoder for motor turnouts like Lemaco, Tillig, Conrad, etc. Can be configured to control two triple turnouts with the needed sequence of motors for correct movement to each of the positions (right-center-left). Can also be configured to control one triple and two normal turnouts, or four normal turnouts. The pulse duration is programmable between 0.02s and 5.1s. It is also possible to maintain fixed the output. 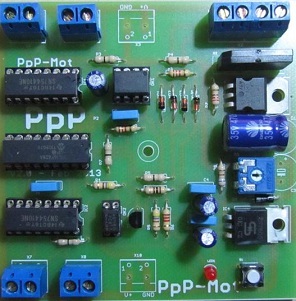 The decoder outputs provide a voltage for motors adjustable with potentiometer between 5V and 18V to vary its speed.